A team is formed when more than one person is involved and work according to the norms set by the organization. When more than one person with the heterogeneous nature comes together, there is always the possibility for conflict to take birth. Conflict in an organization arises when there is a difference in ideologies, beliefs, experience, skills, viewpoints, circumstances, rules, methods of working and so on. All these come under sources of conflict. Conflicts within an organization should not be ignored instead one should complain, blame or should even deal with it with common strategies of compromise or negotiation. One should understand and go in depth of the matter and then should solve it step wise step by maintaining a healthy balance within the employers and in the organization. So this is called conflict resolution in the workplace. This is the initial step to resolve the conflict in workplace. The head or the leader should refer the conflict in teams by going in depth of it, so that the reason is known behind the matter. The head should discuss the matter with other team members and then after thorough discussion one should start the conflict resolution process. Referring the conflict at work means to have a view or an overview of the matter that what exactly has happened. This should be done as soon as possible because if the issue is not seen or taken into account within the time, the conflict rises to a larger extent. It ultimately affects the working, pace and the organization on the whole. 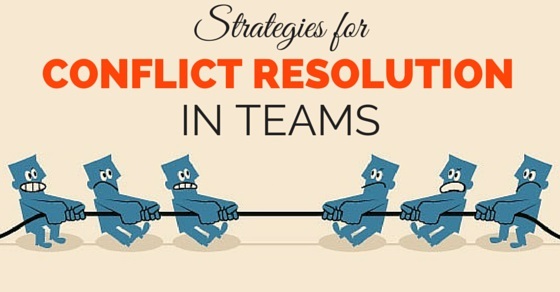 After referring the conflict, see its impact on the working and performance. Then discuss it with the team members. After the team members know about the conflict, they should start the process of resolving it after reaching the consensus. At this point, the need for cooperation is vital because if every member of the team will cooperate only then the work on the resolution of conflict will commence. Seeing the impact will help the members to know in which manner the problem should be solved and by using what kind of strategy. Sometimes, the issue is small and its impact too, but the strategy used to resolve the issue is lengthy, and then it wastes time as well as the money. So, to prevent such wastage of time as well as the money, one should evaluate the impact properly. Communicating throughout the resolution is necessary. The communication should be kept open. The team members should talk about the issue openly that too with active participation. In order to communicate well, one must be a good listener. Listen to what others say and then respond accordingly, but in accordance with the discussion and resolution. Communication will help every member to participate and will also give them a sigh of relief as by communicating many ideas arrive and the issues are solved automatically. Next step is to know the situation well. Each member of the team should discuss his or her point of view, so that everyone’s view and point is heard. Remember, while the conflict is being discussed, emotions should be kept aside and the real issue should be taken into notice. If emotions are not kept aside, then the conflict may not get solved. So, better to understand the situation well at the professional level, in order to get good results. Every member will have different point of view, so it may further lead to conflict, so to avoid, one should explain each member with his or her real positions so as to identify and articulate the matter properly. So give positions and tasks to each and every member of the team a duty will help clarify the problem in a much better and smoother manner. Assumptions are the estimates made while analyzing the matter. Assumptions are the best way to know what would have happened in the matter. They are the pre analysis made to solve the situation well. The assumptions set a kind of foundation for the leader to start the process without any difficulty. Making assumptions can be a negative move also, so one should make assumptions according to the situation otherwise the problem might increase due to wrong assumptions. Making smaller groups will make the work easy for the leader in solving the matter. It will not only save the time but will also soothe the process of solving the matter. Separate the people with similar alliance. In such smaller groups analyze each and every position. By considering all the positions, the group will get a better understanding of the matter and will help in the further process of solving the problem within the organization. Whenever a conflict takes place, there are always two sides, one opposing side and the competing side. The accommodating strategy, says that give what the opposing side wants. It is a kind of strategy in which one party seeks to perceive peace and wants to solve the issue without creating a hullabaloo. This strategy is a kind of compromise by one party as it agrees to give all what the opposing party demands for, but this strategy works in situations where immediate results are needed. It means to integrate the ideas of both the parties. The main aim is to form a creative solution which is acceptable by all. So, the leader of the organization must collaborate the ideas, beliefs and opinions of both the parties so as both the parties reach a common solution, thus, the resolution of the conflict will be done. This process of collaborating will not only help solving the issue peacefully, but will also not create any internal problem that arise sometimes while resolving the issue, thus creating a hinderance in resolving process. It simply means to ignore the problem. In small organizations the issues usually tend to be small. So, for such small issues and conflicts the leader decides to just ignore a conflict, hoping for the problem to get solve itself. This kind of strategy can only be applied when the issue is small enough to be ignored. This is because at times the small issues become big and then the problem gets worse. Then such worse situation becomes difficult to handle. Also in case of large size organization, this avoiding strategy must be avoided. It is a kind of strategy in which the leader asks both the parties to drop the elements of their positions so as to come to an acceptable decision, if not agreeable. It means to say yes by keeping aside own views and also the other party to do the same. This type of strategy works only when both the parties have equal power, status and the position in an organization. Competition is a process in which one party wins while the other loses. This kind of strategy is healthy as the conflict is taken in the form of competition. This strategy works well in the case where the conflict is not so serious, especially in the case of emergencies. The leader asks both the parties to compete and the party that wins are given the chance to say and do what they wanted but that too in a peaceful manner. In this way the work efficiency of the employes also increase and the atmosphere remains the same. This way the conflict ends in a healthy manner. So, above are the tips or the strategies that can be used in every organization. In all sizes of organization, large, small or medium, the above strategies can be used. These strategies work differently in all situations. The conflicts are meant to rise in the places where there is more than one person. This is because, in every organization or the company the employees are from different background, religion, all have different methods of working, ideas, views, strategies, goals, positions in the company. So, when all of these different views and goals come together, the matter becomes an issue while the issue turns into large conflict. To build a peaceful atmosphere in the company, the people with heterogenous nature should come together with a common belief, only then the conflicts will get permanent resolution.